Birds of a Feather [Audiobook Review] – my books. my life. In this sequel, Maisie is hired to find the daughter of a successful business man. But while looking for Charlotte, Maisie stumbles upon a bigger mystery, one that has left Charlotte’s three school friends dead. Now Maisie must solve these murders in time to save Charlotte. 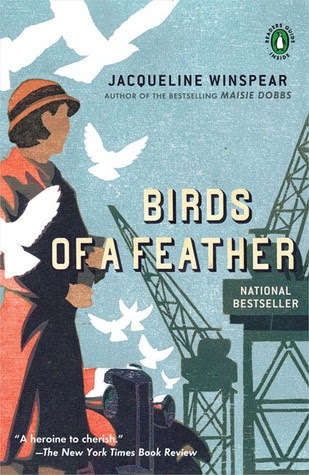 While the first Maisie Dobbs was largely dedicated to backstory, Birds of a Feather is focused on the mystery at hand. However, there is still much living-in-the-past going on. A decade later, The Great War continues to play a large role in who people are and why they act the way the do. This book, while offering a compelling mystery, also paints a detailed picture of life at the time. This combination is what leaves me unable to put these books down. Birds of a Feather is a worthy follow-up to Maisie Dobbs and I am looking forward to continuing the series. My first reaction was disappointment when I realized this was not the same narrator as the first Maisie Dobbs. But Ms. Hicks won me over. She did an excellent job narrating this and I continue to enjoy experiencing Maisie Dobbs on audio. I have a lot of trepidation about picking up any more books in this series. The first book was wonderful and also awful for me. I liked the historical bits, and the thwarted love story, but I hated the mystery, and that is what has kept me from going back to this series. Your review makes me think that it might be good for me to take a chance on the Maisie books again. Thanks for sharing this excellent review today. I think the first had the least satisfying mystery, for what it is worth. I really enjoyed Maisie Dobbs on audio, but have never gotten around to continuing with the series. Glad to hear Kim Hicks won you over with her narration. I’ll listen to Birds of a Feather eventually.